Nice small flat, 5 minutes walk away from a really lovely beach. Pleasant swimming pool area in the back of the building. It's situated in nice and quiet calm place in Suances. Close to the beach. Nice a tidy room. Nice appartment on a ground floor with a beautiful terrace. Well equiped, good parking. Tenía de todo y estaba muy limpio. Además la zona genial y al lado de la playa. La habitacion era magnifica muy comoda y espaciosa. La paz que se respira, no se oye ningún ruido exterior. Volveremos sin dudarlo. As pessoas muito solicitas, fomos muito bem atendidos. Voltaremos quando voltar a Espanha. La equipación y la limpieza son muy buenas. Apartamento amplio con terraza y con ascensor. La nevera y la calefacción estaban encendidas y funcionan perfectas. El apartamento entero estaba genial, todo muy limpio, con bañera incluida y la cama muy cómoda para un buen descanso. El trato recibido por el personal de allí comprensivo y amable. Lock in a great price for Apartamentos Acacio – rated 8 by recent guests! Apartamentos Acacio This rating is a reflection of how the property compares to the industry standard when it comes to price, facilities and services available. It's based on a self-evaluation by the property. Use this rating to help choose your stay! One of our best sellers in Suances! 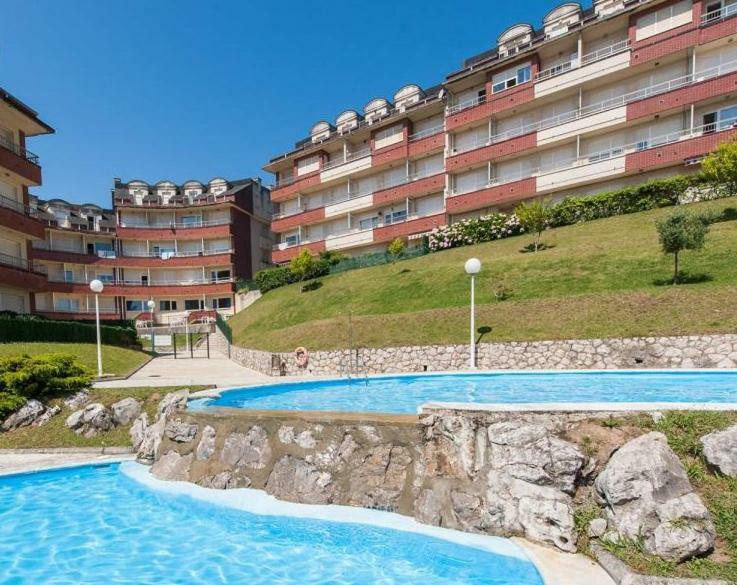 The Apartamentos Acacio are located in the small fishing village of Suances, 350 feet from La Concha beach on northern Spain’s Cantabria coast. This property provides an excellent base to explore the historic sites of the region, including Santillana del Mar and the Altamira Caves. Back at the property you can enjoy a fresh-air swim in the outdoor swimming pool, set in the gardens. 뀐 Located in the top-rated area in Suances, this property has an excellent location score of 8.4! When would you like to stay at Apartamentos Acacio? This studio includes a kitchenette, a bathroom and a lounge-dining room with a double bed. This apartment has a double bedroom, a kitchen, a bathroom and a living-dining room with a sofa bed. Please note, the sofa bed is only for children, not for adults. Acogedores apartamentos a dos minutos a pie de la playa principal de Suances con jardín y piscina comunes. Somos una pequeña empresa que gestionamos varios apartamentos, nos encanta hacer bien nuestro trabajo y sólo deseamos que nuestros clientes se encuentren como en casa. House Rules Apartamentos Acacio takes special requests – add in the next step! Apartamentos Acacio accepts these cards and reserves the right to temporarily hold an amount prior to arrival. Keys should be collected from the nearby Hotel Castillo, located at 141 Calle Acacio Gutierrez. The bed linen in the Apartments are changed weekly. Extra housekeeping is available for a surcharge. Please note that between 15 June and 15 September check-in is from 14:30 and check out is at 10:30. Please note that check-in and key collection take place at: Hotel el Castillo, Calle Acacio Gutierrez 141, Suances 39340. A few things could be improved: there is no air conditioning in the flat, and no awnings in the balcony either: considering the windows are oriented to southwest, the flat is exposed to direct sun rays for almost the whole afternoon and can become unpleasantly hot. The double bed is tiny, and not particularly comfortable either. The flat overlooks the road, so it can be noisy when sleeping with the windows open. I lived in the ground floor so I didn't´have views. The family that I lived under is constantly moving all the furniture(it´s very heavy and it was not the best choice by the owner btw...) mostly between 11:00 PM and 1:00 AM and all of them probably use clogs(maybe they were from Austria). So I will recomend you to take Self-adhesive pads under the furniture with you and become friend with tho ones whom will live above. Good luck. Off season the place was kind of deserted. Bit of a walk from key collection to property. We booked because we were attracted by the thought of having a pool. The pool hadn't been maintained and was disgusting so there was no way you could swim. The equiment in the kitchen is a bit poor. Balcony is very small. The house is badly soundproofed, so neighbours can disturb you at the night.